Im proud to be able to release the new Version 2.0 today. After month of work I think I reached a stable state with all the new features V2 will introduce. First of all: We doubled Jinx! So we now have 8 effect generators at all. To use all these generators in a usefull way, I also made some additions to the scene store. You can now save full (all 8 generators) or half (only one side, means 4 generators) scenes and assign the half scenes to any side of Jinx!. So you can really work with the different sides and crossover single (half) scenes with the main crossfader, this also works with the chase engine. 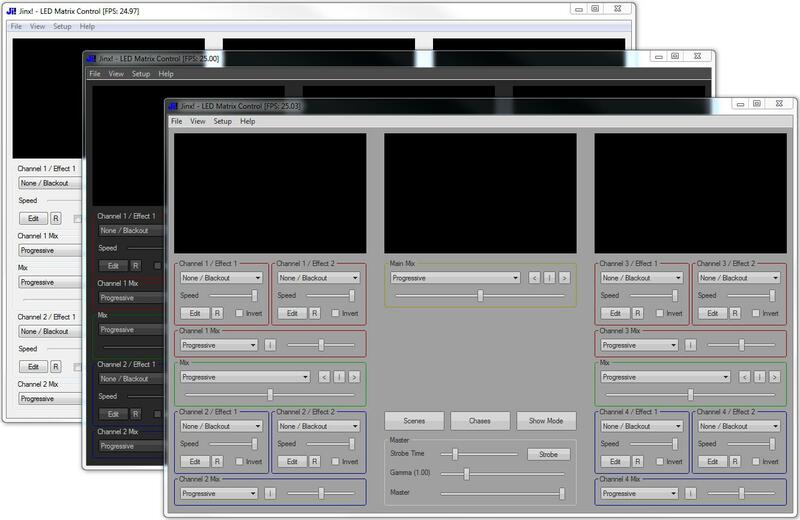 The remote control gots enhanced to use 8 channels now, so you can assign half scenes to the left or right side in Jinx! via remote as well as you can control the main crossfader and the crossfade mode via remote control. Additionally the remote control gots a complete Midi support. Another cool feature are the regions. You can now set a region (size and position inside your matrix) to every single generator, so you can divide your matrix into sections or simply build more complex and cool matrix effects. A lot of work has also been done for the gui. We now have a custom gui, which can freely be colored or you can use the classic window controls like in Jinx! V1. Additionally the scene and chase window is now fully resizable as well and the window sizes, states and positions gets saved into a new options file, which is independent from your show files. implement full and half scenes: on saving a scene you will get asked if you want to save the left or right side or everything (full scene), a full scene will save everything like in V1 and half scene will save only one side without the main mix. To recall a half scene you can click it with the left mouse button to assign left or the right mouse button to assign it right. Inside the show mode you have 2 buttons two set the side the next selected scene will get restored, so you can use it with a touchscreen and dont a need a right click in there. Full scenes are marked inside the scene list with a [F] as prefix. I hope you enjoy the new version and you will keep me always up to date with new ideas you have. There was another bug inside the load/import routine. Scrolling text effects from old file version didnt get imported correctly to V1.51. There was an ugly bug inside 1.51 which could give you problems when storing scenes with scrolling text in it. Because it copied too much data inside the scene store it could overwrite parts of the following scene. Also it would give you some weired effects when copying a scrolling text effect into the internal clipboard. So this is marked as important hotfix, if you already loaded the version 1.51 please update to 1.51a ! Just a small update with some bugfixes and minor changes for the text engine. First of all Jinx!Script has become a modulo operator (%), see the manual for more information. The other changes affects the text engine. In scrolling text, as well as within the expanding shapes effect, it is now possible to use the global font list from your system. Jinx! will display its own small font list as always, but you can invoke the complete list by selecting „More …“ inside the font list and you will get all fonts that are installed on your system to work with (including symbol fonts). The second change inside the scrolling text engine is the possibility to load the text dynamically from a file. After activating and choosing a text file the text that will be displayed gets loaded from the file. The file will also be monitored for changes (last write time stamp) and Jinx! will reload the text when needed. This is especially useful to display dynamic data you get from another application, for example the actual artist and title that is playing within a media player. Only the first textline will get loaded and the file has to be ANSI encoded, the global text limit with 255 chars inside Jinx! will take place in this option as well. I just wanted to send a sign that Jinx! is still alive 🙂 But within in the summer month, I have lot of other work to do. So coding Jinx! further on will have to wait a little bit. I also wanted to thank everyone who support Jinx! and sent me nice mails and ideas, you all keep this software alive and I am always open for new ideas and additions, so feel free to contact me and send me your opinions. What I am still missing are some more reactions about Jinx!Script, which is really powerful. Anyone has already coded some effects? Maybe we can share some cool scripts if you want on this website. I wish you all a great summertime. The new Jinx! V1.5 release will bring you endless possibilities and the power to do whatever you want: Welcome to Jinx!Script, just code your own effects fast, easy and with the full flexibility only a programing language can give you. Jinx!Script is very small but powerful programming language which uses an easy to read and learn BASIC like dialect. You have all necessary functions and commands like loops, conditions and even simple sub routines to clearly code your ideas. You can use easy grpahic commands to plot pixel, draw lines, rectangles and circles and you even can draw text onto your matrix. You also have access to the autocolor values and have the possibility to use an audio trigger inside your own effects. Additional you can export config variables into the Jinx!Script Engine Window, so you can change parameters without editing your source and can even store these exported values into scenes. So you can use effect variations inside scenes without changing anything inside your yource codes. The Jinx!Script engine is a small byte compiler which will translate your code at runtime into its own byte format, which will be run by a small integrated virtual machine. It is my first interpreter/compiler I ever wrote, so it was a lot of more work then I ever thought, you cant imagine how complicated it can be to calculate a mathematical string like ((3+4)*16/3*sin(90/2)-16^2)/(999-13/2) … I worked hard on the engine and it looks very stable and hopefully bugfree to me, so I decided to release it. I added some really nice and useful sample sources into the Jinx! package and ready to run demo scenes, so you can easily test the whole feature. Look at the sample source codes and start to code your own effects. Please take a look at the manual/help file. I tried to write down everything you have to know about Jinx!Script, the commands and the programing rules. I added some small additions to fulfill some user wishes. In Version 1.41 the file pathes inside the avi player, image viewer and jinx file player will be safed relative, when possible. When the linked files are on another drive or network share, the path will still be safed absolut. Additionally I implemented the long awaited unicode text into the scrolling text and expanding shapes engine. So you can use unicode characters to display kyrillic, chinese or whatever language you want. After some lack of time I finished the version 1.4 today. There are some bugfixes as well as some new generators and changes for the spectrum analyzer. First of all sACN is now able to send and receive multicast pakets to match the complete standard, the version check bug on importing scenes is fixed and multiple instances are back. The AVI Player is now able to automatically use the real frame rate which will be given by the avi file itself. A bit more changes have been done to the Spectrum Analyzer. You can now switch the direction the bars will follow to all 4 possible directions and you can reverse the bands as well (means high frequencys left, low frequencys right for example), additionally you can set the bar colors to smooth, so they will fade over to the next color instead of simply changing it. One new generator is called Audio VU Meter. Its very similar to the spectrum analyzer, but will give you the overall rms level instead of frequency bars. You can choose stereo (2 bars) or mono and you can adjust the bars to any direction, width and matrix position. There are 3 colors like on the spectrum bars and they can be switched to color fading as well. For the Audio VU Meter you can also disable the autmatic gain control, so it will show the real level while the spectrum analyzer or another generator channel can use the agc to give a full screen picture. I wish you a happy easter and a lot of fun with the Jinx! version. As already said with the Version 1.31, there was a dependency with the ftd2xx.dll and Jinx! didnt start without these dll or an installed FTDI driver. Version 1.32 now loads this driver dynamically when its needed (Enttec OpenDMX USB), so there is no dependency anymore and you can start Jinx! without this dll or an installed driver. A small bugfix for Windows 8.1 Users. The version 1.3 crashed while starting. Also known is that Jinx! 1.3 is only able to start when a ftd2xx.dll (FTDI driver) is installed. I try to load it dynamically in the next version, so that we dont depend on it unless we need it (it is needed for the Enttec OpenDMX driver). In the meanwhile you can download the dll here if you dont have a FTDI driver installed and simply store it inside your Jinx! folder.